DoN is extremely grateful and humbled by the wonderful turn out of old and new friends, fellow artists and enthusiasts who came out last Tuesday to hear him speak about his collection of photographs called “light beings”. Thank you so much to the hard work of Amie Potsic of The Center for Emerging Visual Artists for arranging the event which drew about 70 people to hear DoN talk about the origin of the concept, how the photography and presentation is realized, which cameras DoN prefers and stories about the people in the titles. To say that DoN‘s mouth went dry when he saw the sea of faces is an understatement, at one point his upper lip curled up onto his dry teeth so much he had to reach up and un-stick it. Everyone said they didn’t notice but DoN thinks they’re just happy it wasn’t them dealing with a bit of stage fright. Luckily, DoN‘s speech went well, even if the people in the back of the room stoically stood their ground while they mouthed, “I can’t hear you.” People, if you can’t hear, sit in the front row – duh!?! And the art raffle was a success, too – DoN offered art cards as raffle tickets and sold enough to raffle off an art work. Ironically the winner of the drawing is one of DoN‘s collectors who had already purchased one of the works from the exhibit. Since the raffle was so successful, DoN is extending the offer because CFEVA has arranged for the show to hang three extra weeks! If you have already purchased a raffle card you are still eligible to win, contact DoN to purchase your cards for a chance to own one of DoN‘s photographs. If you haven’t seen the show, please go, the space is beautiful, the staff is cute and the coffee will keep you awake all night. 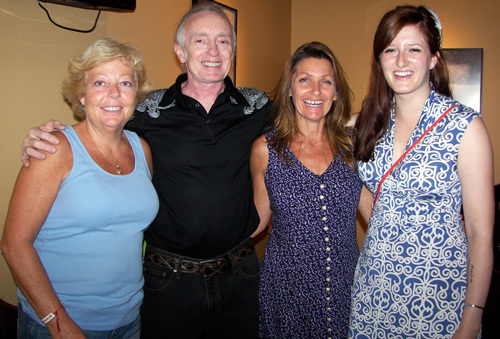 Kathleen Rockwell, DoN, Lori Hess and Carly Valentine @ The Radisson Warwick Hotel’s, The Coffee Bar. Back in the late 80’s, early 90’s, DoN was a member of The Regional Art Association, a grass roots arts club who met in the dilapidated Clementon Court House. Kathleen, Lori & Carly’s grandmother, Jean Walsh, kept the group going for almost a decade, when DoN lost his job with a major communications company and returned to art school full time, these fine folks supported and encouraged him to push ahead and realize a dream. 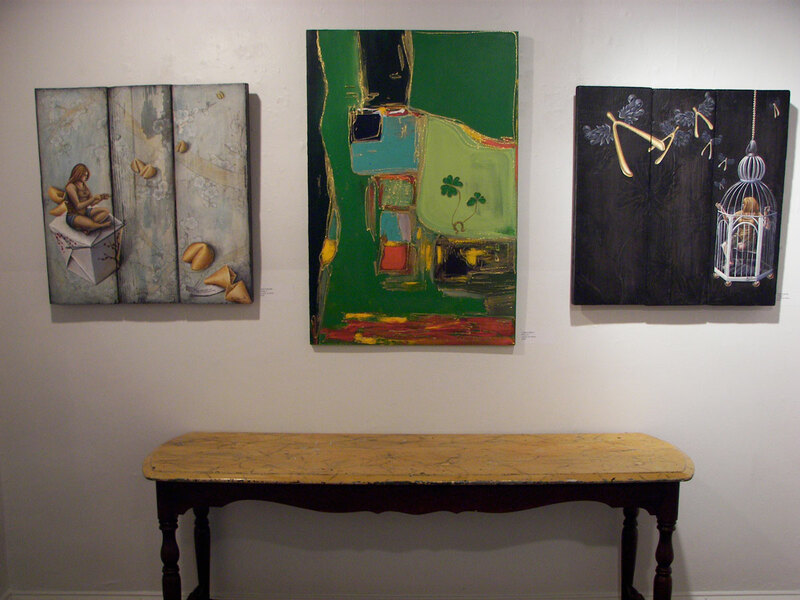 Thank you to Shoshanna Aron, Alden Cole and Les Howard for helping to install the show and their continuing love and support. Thanks to Ona Kalstein and Ted Warchal of Da Vinci Art Alliance Board of Directors for their confidence and encouragement. Thanks to Danny Reilly of the Photographic Society of Philadelphia for taking pictures and just being there, Danny is a great photographer, it’s an honor to have him document the event. Thanks to Lisa, Regina, Faith, Fran, Jean-Paul, Karen & Don, Sheila, Deb, Helen and all of the friends and family who came out to Center City on a hot Summer night to hear DoN. Without the interest and recognition of art enthusiasts, making art can be a lonely pursuit, but, when you feel the love, it’s totally addictive. This entry was posted in Art in Philadelphia, Art Spaces Philadelphia, Center for Emerging Visual Artists, Da Vinci Art Alliance, DoNBrewer, Fine Art Philadelphia, One-Person Art Show, Philadelphia, Philadelphia Abstract Art, Philadelphia Art, Philadelphia Art Galleries, Philadelphia Art Installations, Philadelphia Art Shows, Philadelphia Artists, Philadelphia Artists, Philadelphia Photographers, Photographic Society of Philadelphia, Photography Philadelphia, Uncategorized on July 27, 2010 by admin1. light being (Anne D’Harnoncourt), DoN Brewer, art card @ The Coffee Bar, 17th & Locust Streets – A Center for Emerging Visual Artists Event. This image did not make the show because of soot damage to the original photo – a tip: frame your photos under glass, glare-free if possible. DoN‘s art cards are printed locally by Media Copy in Center City – thanks to Debbie and the crew for their great work. Tuesday, July 20th, 2010 @ 5:30 PM, CFEVA will host a closing party and artist talk for DoN Brewer at The Radisson Warwick Plaza Hotel, The Coffee Bar, 17th & Locust Sts. 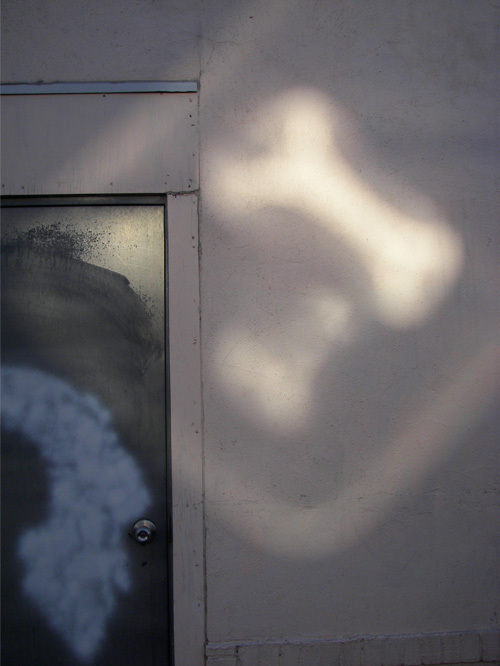 DoN is raffling off one of the photographs by selling limited edition greeting cards, signed and numbered, $5. each or 3 for $10.00 – 25% of sales is dedicated to a well deserved commission for CFEVA. If all 200 cards sell, two pieces will be raffled off. The exhibit is on display through the end of July. 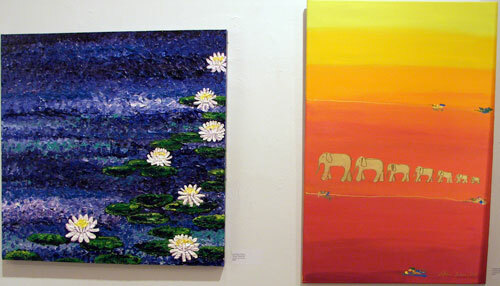 Thanks so much to The Center for Emerging Visual Artists for their love and support. This entry was posted in Art in Philadelphia, Art Spaces Philadelphia, Center for Emerging Visual Artists, Coffee Shops, DoNBrewer, Light, One-Person Art Show, Philadelphia, Philadelphia Abstract Art, Philadelphia Art, Philadelphia Art Galleries, Philadelphia Art Installations, Philadelphia Art Shows, Philadelphia Artists, Philadelphia Artists, Philadelphia Photographers, Photographic Society of Philadelphia, Photography Philadelphia, Prints, Uncategorized on July 20, 2010 by admin1. 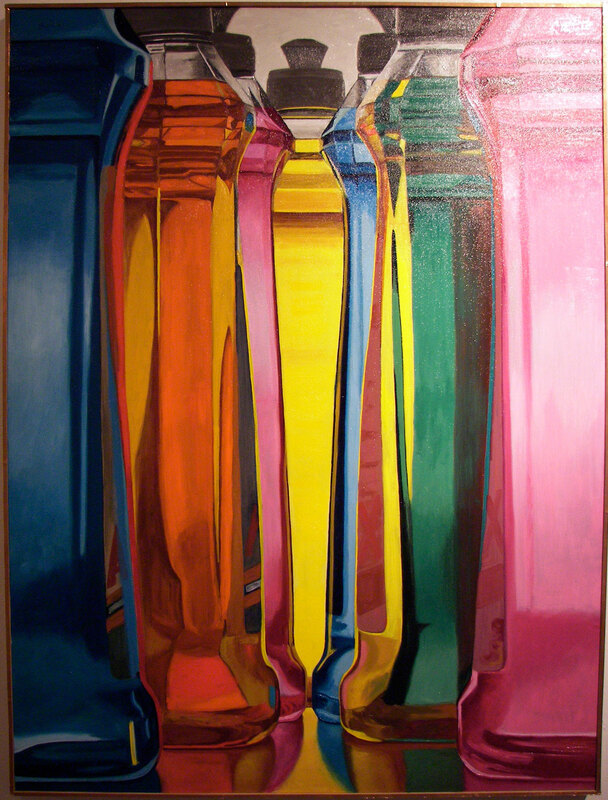 Seven Dishsoaps, Peter Seidel @ Da Vinci Art Alliance, 7th & Catharine Streets in South Philly. Peter Seidel won the Da Vinci Art Alliance Gold Medal for his superb painting. 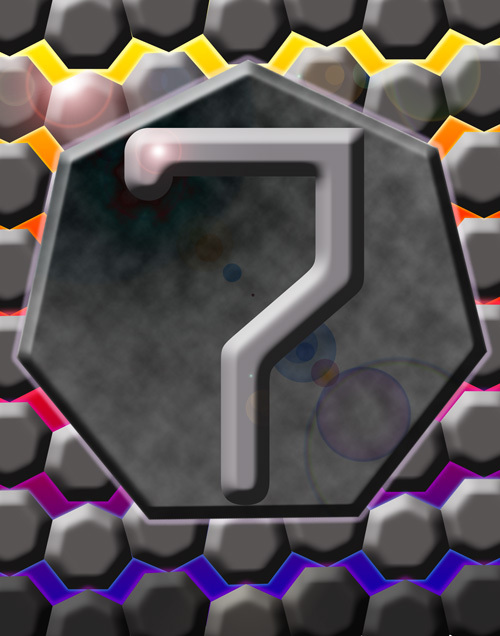 DoN Brewer, Heptagon, photoshop. DoN was honored to be on the jury committee to select the medal winners, which also freed him to produce whatever he wanted for the show. Seven will be shown at The Noyes Museum annex in Hammonton, NJ this Fall. Lois Allen Charles, Seven Waterlillies and Lilliana Didovic, Seven Elephants @ Seven, the current member exhibition at Da Vinci Art Alliance has a wide interpretation of the symbolism of the number seven, yet the discussion around the sign went on long after the show was installed. The DVAA exhibitions committee really tapped into a concept the members could grok. 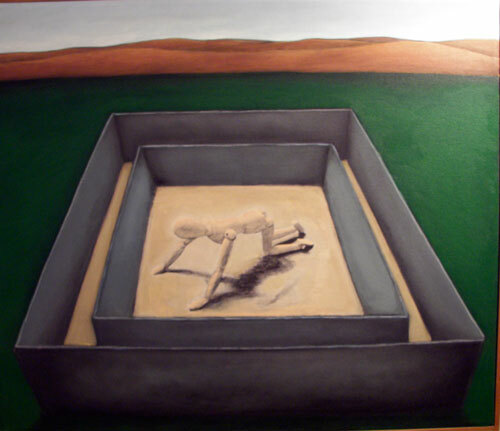 Anna Vosburgh, Hope 1 @ Da Vinci Art Alliance – Anna is not only a great painter, she’s a blogger! Alden Cole , Burning Man, oil on canvas. 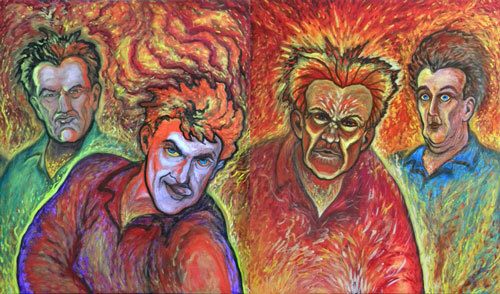 Alden Cole completed his series of self portraits portraying the Seven Deadly Sins, the first three sins are included in a painting Cole produced for DVAA‘s Henry IV, Part 1 @ The Lantern Theater Company’s Black Box Gallery. These two panels, though, are more explosively emotional, brashly colorful and deeply introspective; Alden acts for the camera then paints the facial expressions with light, color fields and texture as if he’s looking deep into your being, reflecting back the many faces of sin. 7 screens, 7 colors, 7 minutes – cool. Anna Vosburgh & Lilliana Didovic @ Seven in the Da Vinci Art Alliance Gallery, Summer 2010. This entry was posted in Art in Philadelphia, Art Spaces Philadelphia, Da Vinci Art Alliance, Drawings, Fine Art Philadelphia, Mixed Media Art, Paintings Philadelphia, Pastels, Philadelphia, Philadelphia Art, Philadelphia Art Alliances, Philadelphia Art Clubs, Philadelphia Art Galleries, Philadelphia Art Installations, Philadelphia Art Shows, Philadelphia Artists, Philadelphia Artists, Philadelphia Photographers, Philadelphia Pop Art, Plastic Art, Prints, Uncategorized, Watercolors on July 19, 2010 by admin1. 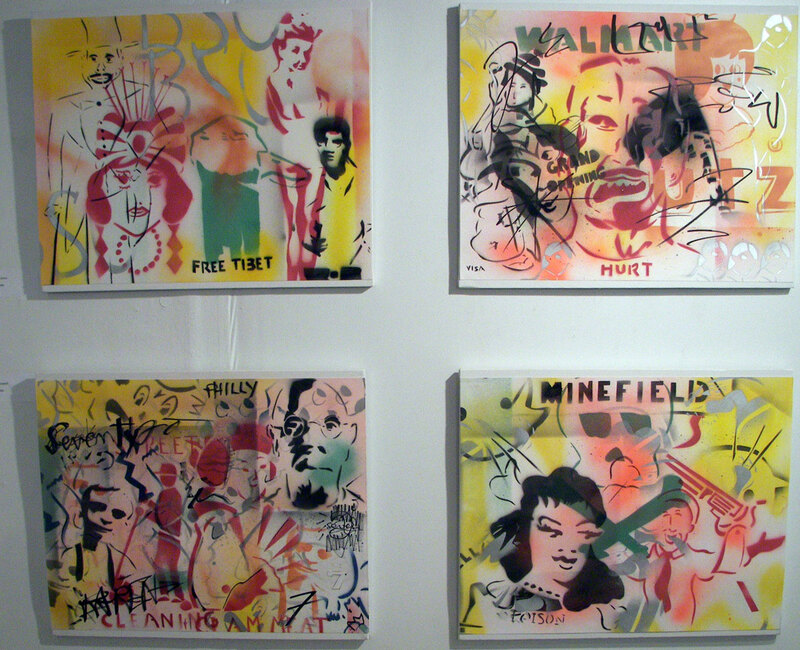 Rosalind Bloom @ Smile Gallery, 22nd & Walnut in Center City, Philly. 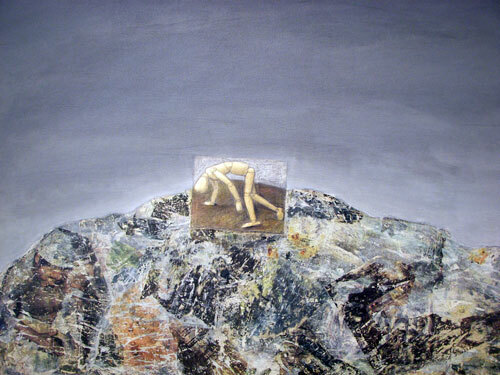 Rosalind Bloom‘s model’s dummy poses in pain and peril a top a slippery slope of rock and ice. Bloom mixes metaphors and media creating deeply intimate portraits of human emotion as if the dummies are trying to find their place in a confusing world. 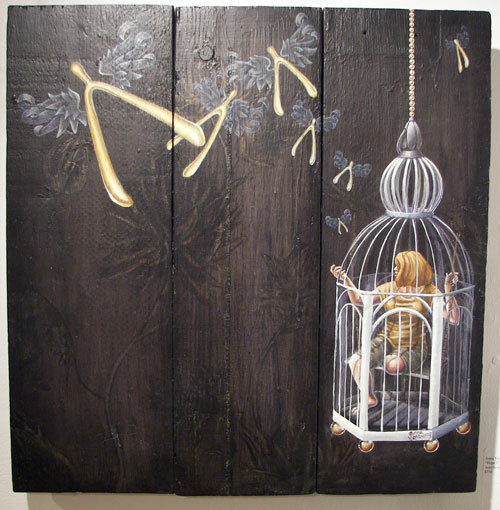 Sharri Jerue, Indecision, mixed media @ Smile Gallery. 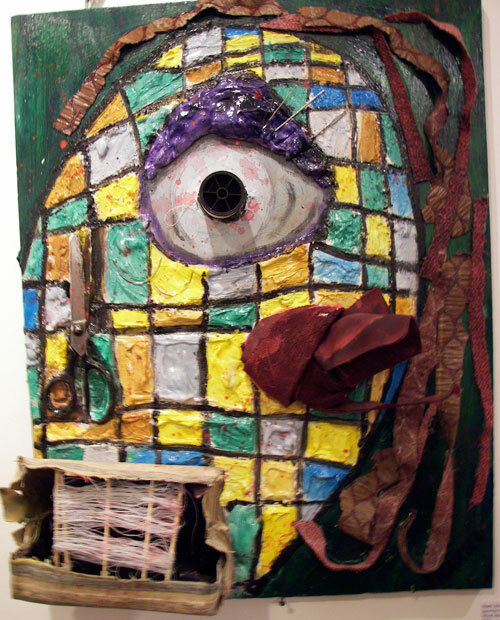 Sharri Jerue is a scenic designer who usually has to realize other people’s ideas but in the Faces and Figures show @ Smile, Sharri is able to mix and mash her ideas into anthropomorphic heads, using found materials with abandon. 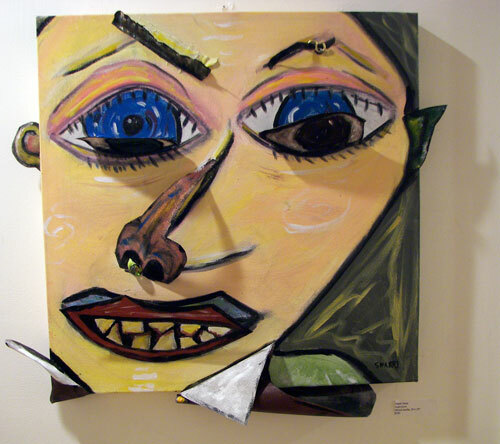 The inspired combination of wacky heads and puppets in peril is the brainchild of Dr. Deb Miller who saw the neural network between simple shapes and ideas and racial memory based deeply in our brain stems stimulated by paintings and sculpture. 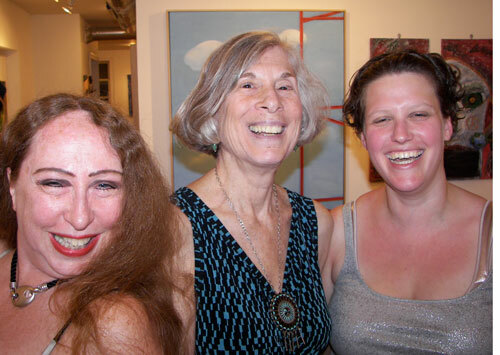 Curator Dr. Deb Miller, artists Rosalind Bloom and Sharri Jerue at the opening of Faces and Figures @ Smile Gallery in Center City. This entry was posted in Art in Philadelphia, Art Spaces Philadelphia, Ceramics & Sculpture, Da Vinci Art Alliance, Fine Art Philadelphia, Mixed Media Art, Paintings Philadelphia, Philadelphia, Philadelphia Abstract Art, Philadelphia Art, Philadelphia Art Alliances, Philadelphia Art Galleries, Philadelphia Art Shows, Philadelphia Artists, Philadelphia Artists, Philadelphia Pop Art, Philadelphia Sculpture, Recycled Art, Uncategorized on July 17, 2010 by admin1.